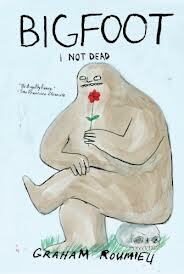 According to The Hollywood Reporter, the network has placed a pilot order for an animated comedy based on the “autobiographical” books Bigfoot, by Graham Roumieu. Comedic actor, Seth Rogen (This is the End) and writer, Evan Goldberg (The Watch, Superbad) will serve as executive producers along Archer creator Adam Reed and Graham Roumieu, Jimmy Miller, Matt Thompson and Sam Hansen. Matt McKenna (American Dad) will write and act as supervising producer. Rogen promises that “This will be the greatest show about an animated Bigfoot ever made.” We sure hope so, Seth! We’ll keep you posted on when the pilot will air.